Since finding their marriage record that I talked about in my last post, I’ve done my best to transcribe and translate it to the best of my ability (and Google Translate.) Here is what I was able to translate, with some notes within and more notes after. Tagloehner(?) (day-laborer) known as Franz Zalewski, Catholic religion, born the fourth of October the year on thousand eight hundred fifty-eight in Krotoschin in Loebau, resident of Gottschalk in Graduenz. Known as Anna Lindner, catholic religion, born the fifteenth October (incorrect? 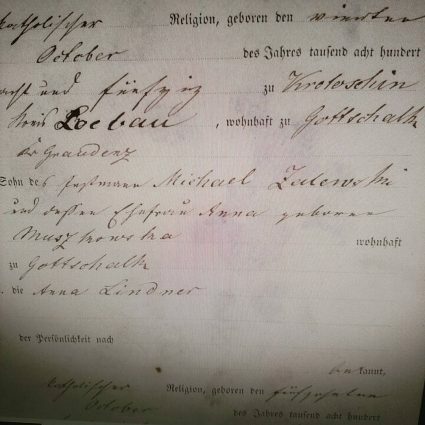 baptism record is in Sept 1865) of the year one thousand eight hundred sixty-five in Schwenten in Graudenz, residing in Schwenten in Graudenz. Daughter of (?) Johann Lindner and (?) (?) Eva born Sonnenfeld residing at Schwenten. A few notes here. It describes Frank’s birthday as 4 October 1858, which is probably correct. I’ve always had 4 Sep 1858, but I honestly don’t know the source of that specific date. I’ve never seen it myself, though the year is probably correct as that has been found in multiple places. I also now have Frank’s place of birth, which is a nearby town named Krotoschin in 1884. Today it is Krotoszyny, Biskupiec, Warminsko-Mazurskie, Poland, just northeast of their marriage location. I don’t know if Frank’s mother’s last name is Muschowska. It’s a bit tough to read. All of the question marks (?) in the transcription are words I could not make out. 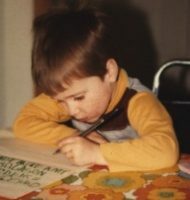 Lowercase letters like e, n, and r look very similar in German Gothic script especially when the writer is a bit sloppy. They all look like one squiggly line with a few peaks and valleys. Most of the missing words are the occupations of the individuals. The three X’s at the bottom near the four names is probably similar to “his mark” in other documents stating that the person could not write their name. For whatever reason, it looks like Anna’s birth date is wrong. I’ve previously found her baptism record in the church records and it was from September 1865. This states she was born in October. The only other new item is the name of one of the witnesses, Franz Gurski. Not sure who that is, so I’ve been looking for the Gurski name in the rest of the civil records. I found a few birth records for Franz and his wife. I’ve also found a few more Zalewski/Salewski records and I’ve made note of them. They’re probably, or possibly, related to Frank Zalewski. Unfortunately, the civil records only go back to 1874, so I will need to track down the church records to see if I can find Frank’s baptism record in Krotoschin.